The depth map is derived from a structure map of the top of the Paluxy sand (Core Laboratories, 1972). 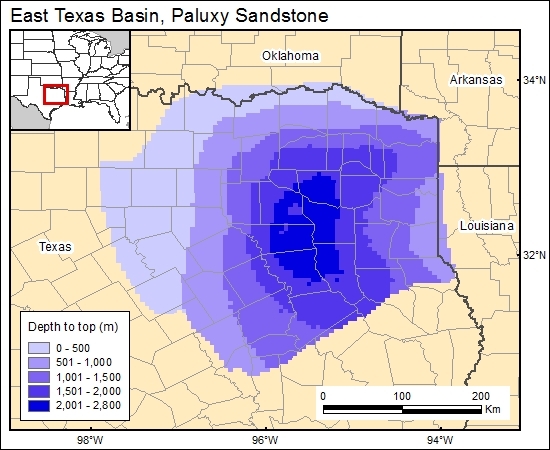 This map also shows the effect of salt structures on the Paluxy Formation. We then used a DEM generated from Digital Terrain Elevation Data (National Imagery and Mapping Agency, 2000) to calculate and grid the depth to top formation (c1paluxyg). Core Laboratories, Inc., 1972, A survey of the subsurface saline water of Texas: Texas Water Development Board, Report 157 (1), 12 p.